– I am privileged to share display space with several other members of the North Windsor Artists. I have selected artwork available for printing on demand for high quality reproductions and note cards. Matting and framing is also available which is especially nice when purchasing a gift. Note Cards can be tailored by you for image size, black or white backgrounds, and blank or custom inside message. Avilu Press and DeSio Studios have produced their second volume in their “Artists of Fredericksburg” books which was released in August of 2012. Volume II is titled “Drawn Together”. This name was chosen by the group of artists featured in Volume II. This was a really fun project to participate in and I am pleased to be one of the artists featured in Volume II. “Drawn Together” features 10 Fredericksburg area artists: Nancy Brittle, Audrey Bruno, Elizabeth Butler, Beverly Coates, Cathy Herndon, Johnny Johnson, Ruth Ann Loving, Robyn Ryan, Jane Snead, and Norma Starkweather. 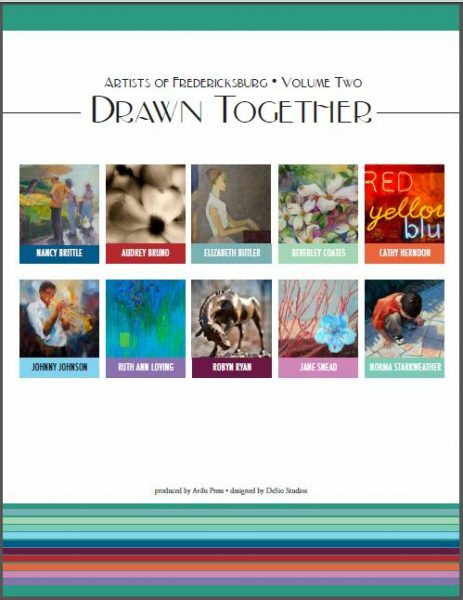 You can preview and purchase “Drawn Together ~ Artists of Fredericksburg Volume II” online at Amazon.com. “Notes from the girl in seat 7” was written by the daughter of a good friend. They asked me to illustrate the book for them. The book is a delightful read by an insightful young lady. The official description is “An anthology of poetry and short stories covering a wide range of topics from nature to fantasy to ethics.” It was great fun to participate in such a unique project and I think you will enjoy the book! You can preview and purchase “Notes from the girl in seat 7” online at Amazon.com.